This quilt is not that big and there were times when I had to have some of it hanging off the table. The quilt clamp helped to support that weight like this, and they worked even better when most of the quilt was on the table. I will continue to use the clamps because they really do help. NOTE: The clamps can swing around a bit if you aren't careful when you release them. I've had to clear the cute stuff off of my windowsill so that I didn't break anything. I so enjoyed your presentation last night at the Lewisville Guild meeting…just bummed that you had to stop due to time constraints. That business meeting was tooo long and would much rather have been listening to you! Am sure the question and answer time would have been been good. But whatever, I did enjoy your lecture and the quilts. I will continue to read your blog as I told you last night as I do enjoy it. And hope someday to be able to take an applique class….in the meantime, will search for the DVD. Do you ever teach at Festival? I did look on the blog for your schedule and saw your lineup–but doesn’t show which classes are applique. Will hope find one someday. Oh dear that fabric in the quilt has set my heart racing. Is that your fabric range? If so I want to be first in line please. I must have some. I agree with Jan. Love the fabric and also love that big flower I can almost see. Keep the designs coming!! Oh, and I heard you on the Pat Sloan show. Personally, I think the DVD is a must and the Applique Sampler book is a great addition to it. I’ve given both to several women I know who wanted to learn needleturn. Hi Carol! I did have a good time talking to your guild on Monday night – you all are an easy group to talk to! In answer to your question as to which classes are applique classes – they pretty much all are. I rarely am asked to teach anything else. Where I have one, I post some sort of contact information for the place where I will be so that you can find out the specifics from them. I hope to see you in class someday soon! I am so happy to hear that you like the new fabric! Yes, this is from the new range and it will be on our site in early January. I have to say that this is really fun fabric to work with. It mixes and matches so well that Linda and I are both loving it – and we think you will too! Can’t wait to see the whole quilt! 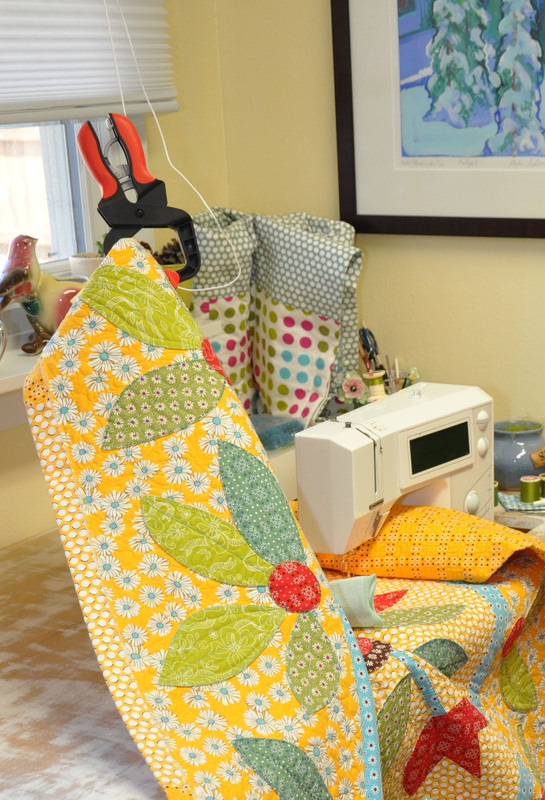 The fabrics look so fun and happy, as does the quilt! Love this quilt and the fabric is wonderful, can’t wait to get my hands on lots of it! the parts that i can see look beautiful!! i look forward to seeing the entire quilt at market! That quilt is called Texas Tulips and it was in American Patchwork and Quilting a year or so ago. We did have kits then, but its long gone. I will try to get the pattern online this weekend and Ill bet you can find fabric that would be lovely! You might even find some on my fabric page :-). That quilt and the fabrics are just darling! My husband and I put up my pulley and clamp system today and I am so excited to try it. So far it looks like it is really going to be a big help. Yes, I do think you are going to love having the clamps! They make me happier when I am machine quilting :-).